A fan of shows such as “CSI” and “Law & Order”? In the second of our two-part interview, NJIT’s Professor of Practice in Forensic Science, David Fisher, discusses crime-fiction television and some popular myths about today’s world of forensic science. In 2012, CBS’s crime-fiction television drama, “CSI: Crime Scene Investigation,” reached the zenith of primetime television ratings. That year, the show’s estimated 63 million viewers across five continents earned it the title of “most watched television show in the world” for the fifth time in the show’s history at the Monte Carlo Television Festival. 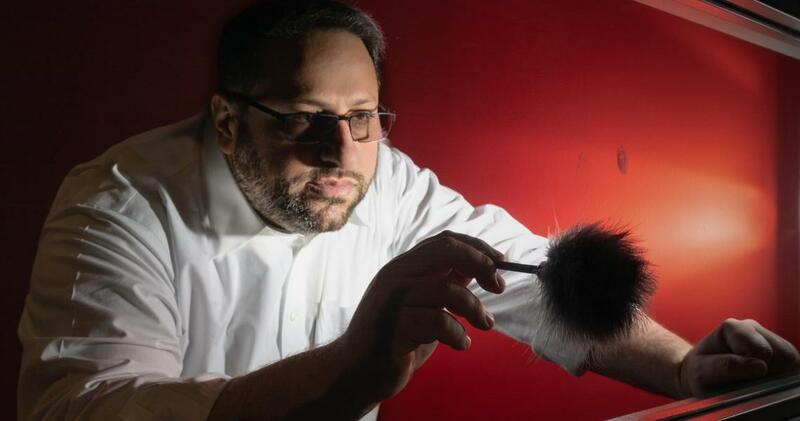 Here, we conclude our two-part interview with David Fisher, NJIT’s newly appointed Professor of Practice in Forensic Science, who joined to discuss basic misconceptions about the world of forensics and crime scene investigation, and explain what really goes on in today’s forensic crime laboratories. What are perhaps the most common misconceptions about forensic research and crime scene analysis that you think may exist today from popular culture and shows like “CSI”? I think a lot of CSI-style shows often portray forensic scientists as members of law enforcement, when in reality, forensic scientists should be totally neutral. The most ideal crime laboratories are not under the organizational structure of a police department or prosecutor’s office, but they operate under their own autonomy and funding to try and remove biases in how evidence may be analyzed and documented. It is always important to remember that as a forensic scientist, you have no skin in the game. In fact, when it comes to processing evidence, particularly when it can potentially acquit or convict someone, it is probably better not to know all the circumstances of the case. Having an independent crime laboratory can help minimize bias compared to a laboratory managed by a police department. Also, the roles and responsibilities of forensic scientists tend to be pretty specific as well. It is unrealistic that a forensic scientist would ever interrogate a suspect or chase them down an alleyway to apprehend them. They tend to be in the lab working their cases, and testifying in court when necessary. At New York City’s Office of Chief Medical Examiner (OCME), you taught workshops in “Medicolegal Death Investigation” and “ Bloodstain Pattern Analysis.” How important is addressing the “CSI Effect” when it comes to educating students about the real world of forensic science? I think some students are initially surprised about the amount of science involved in the field of forensic science. However, I think students are amenable to the fact that, as it should, forensic science involves the scientific method and using science to seek justice. One of the ways to bring these concepts home to students is by teaching them how real-life cases have been solved by applying chemistry, physics or biology. Students really respond when they see how something that they learned in one of their lower-division courses has a real-world application and significance in that way. What are some of the persistent, real challenges you dealt with in the lab as a professional criminalist that people outside of the field might not be aware of? The time it takes to methodically analyze and process evidence. On television, cases get solved in 40 minutes plus commercials. There is the impression given that forensic scientists can put a sample in a mysterious black box and instantly the word “match” will appear on the computer screen. In reality, even with the technological advances in crime labs today, a major homicide case could take weeks, if not months, to complete all the testing that is required. People forget that in addition to the benchwork that must be performed, a case report needs to be written. The file needs to go through a technical review by another analyst, as well as an administrative review before the results can be released. Results need to be accurate and thorough. These reviews take time and that is where the bottleneck lies in most crime labs. Contrary to popular fiction, could you talk about the scrutiny that some of the forensic disciplines have faced over the past few years, particularly in areas like bite mark evidence and microscopic hair comparison? How has that evolved in labs and in the way it is handled in court now? Unlike DNA, which has been heavily studied by researchers in academia and industry for decades, some of the pattern matching fields — such as bite marks and microscopic hair comparisons — do not have enough of a scientific foundation to be held up to scrutiny. Recently, for example, the FBI conducted a post-conviction review with the Innocence Project and went back and reviewed cases involving microscopic hair comparisons. They found that many examiners gave flawed testimony and overstated forensic matches in a large percentage of cases. The same is true with bite marks. These two disciplines within forensic science are now hardly being performed, and there are a lot of judges who won’t allow that kind of testimony into their courtroom anymore. Ultimately, I think bite marks and hair comparisons are on the ash heap of forensic science history. As an R&D supervisor at New York City’s OCME, you oversaw a team of research scientists that tested new methodologies and technologies that could potentially be brought online for casework. What new advances do you think are most helpful in solving cases or challenges in the field now? Just as you see in other fields, robotics is having an impact and some of the basic testing and test preparation in crime labs is becoming more uniform and more efficient today. Also, the community is beginning to use next-generation sequencing, or massively parallel sequencing technology, which allows much more genetic information to be gleaned. This technology can give a person’s autosomal profile, mitochondrial DNA profile and detect variations in the DNA sequence to help determine a person’s physical characteristics, such as hair or eye color. Having all this extra genetic information can make a big difference in identifying a person. Another interesting area emerging is “Rapid DNA,” which are portable DNA testing devices that allow DNA typing to be performed in as little as 90 minutes. These are deployable in the field, so DNA typing can be done in a mobile lab at the crime scene, and could enable law enforcement to develop leads more quickly. There are still a lot of legal and privacy concerns with this technology, however. In your experience, have you found any instances where the real-life work of forensic scientists is actually more interesting or stranger than the fiction we see on television? There have certainly been outcomes to cases where I have thought to myself, ‘Wow, this case would make a great “CSI” episode.’ Just last year in Sacramento, the “Golden State Killer” case received a lot of attention for that reason. That was a cold case from the 1970s where forensic experts finally identified the suspect by linking DNA samples from the crime scenes with genetic data from the suspect’s distant relative that had been available on an online ancestry database. Generally, the truth can be stranger than fiction. However, forensic scientists will always have in mind that people’s lives and liberty are on the line. Working in the field is very rewarding, and is most likely making a huge difference for victims of crimes and for society in general. But the work has serious implications for others, so it’s vital to bring a scientific and unbiased approach to each and every case, no matter how routine or extraordinary it may be.